If you haven’t learned this by now, the Sega Saturn is filled with beautiful 2D games. And who better to create a unique 2D game than the cult-classic machine known as Treasure. 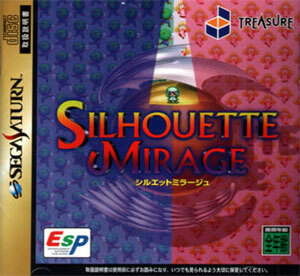 Treasure once again, pushed the 2D envelope to the max on both the Saturn and PSX with a little-known game by the name of Silhouette Mirage. Thanks to Treasure’s creativity, Silhouette Mirage has revolutionary play mechanics and an insane amount of depth. It features gameplay elements depending on changing colors. Treasure fans will point out that they took some of the concepts they learned in Silhouette Mirage and applied them to their later shooter masterpiece, Ikaruga. Unfortunately, Silhouette Mirage was only released on the Saturn in Japan, so admittedly, much of the tutorial is confusing without a translation handy. Legendary localizers, Working Designs later brought the game to English-speaking gamers with a Playstation port. It is difficult to recommend one version over another — the Saturn version is technically superior in terms of animation, backgrounds, voices and such (see here for details), but of course the Playstation version is easier to jump into for the Japanese-impaired. “Silhouette Mirage’s gameplay centers on a very unique gameplay element that comes into effect as the world features inhabitants that are primarily either Silhouettes or Mirages. The Silhouettes and Mirages can be differentiated by their colors; Silhouettes are blue and Mirages are red. 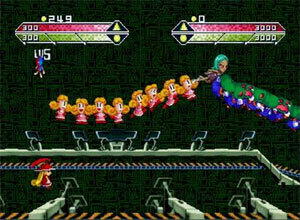 The game’s main character, Shyna, who is called the “Messenger of Justice” and is sent out to save the world, has both characteristics of Silhouettes and Mirages. Depending on which direction she is facing, Shyna will be either red or blue, taking on the characteristics of either the Silhouettes or Mirages. This is where the game’s complex play mechanics first come into play. When attacking an enemy of the same characteristic (Silhouette on Silhouette or vice versa), the shots will steal spirit power from the enemy and add them to Shyna’s bar. When attacking enemies with the opposite characteristic, the shots will cause damage. This seemingly minute element adds an enormous amount of depth to the Silhouette Mirage’s play mechanics. 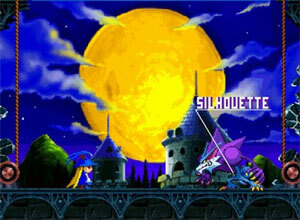 “The world of Silhouette Mirage is a beautiful one. Graphics tarts will no doubt be turned off by the old school graphics, while fans of the genre should appreciate its nice artistry. Character animations are pretty smooth, and some of the bosses are just downright huge and awesome… Weapon effects are quite impressive as well for this type of game, while the backgrounds could have used a little more parallax. They tend to be a little flat, but suit their purpose nicely. Nice job Treasure. “Those looking for some fresh takes on the genre, this game offers plenty of action. The controls are simple to learn, or at least to learn all the moves that are actually important in the game. The important moves include being able to triple jump, shooting with auto aim, grabbing enemies and beating the money out of them, and dashing. That’s all the moves you’ll actually need to beat the game. There are other moves like sliding, and ducking, and doing one big attack that hits everything on screen, but they aren’t necessary, and often make the game harder if you try to use them. It’s simple if you want it to be, and it works better that way. Playing the actual game is a lot of fun. The actual levels are pretty simple, you just fight off a few Silhouettes and Mirages while absorbing some spirit power and beating them for their cash, which brings me to another point.